Explore your own creativity by coloring my original mandala design. 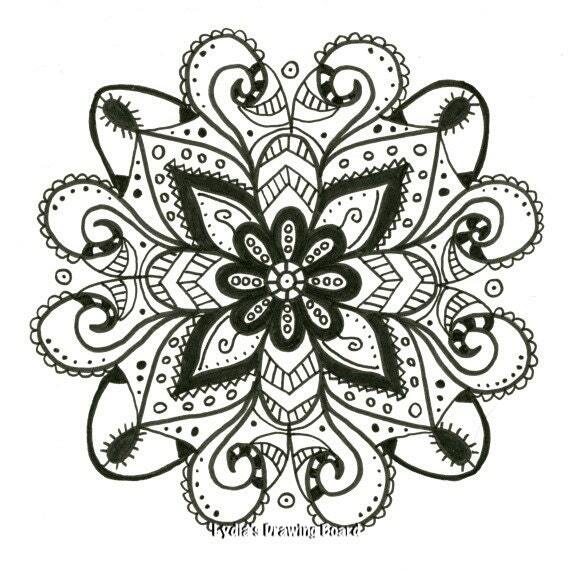 You are purchasing a single coloring page delivered by instant DIGITAL DOWNLOAD. You will receive a PDF file containing a 600dpi image which you can print out or color digitally using a program such as Photoshop. You will need a pdf reader, such as Adobe Reader to view the file. Print using a laser printer to prevent smudging when coloring, especially if you'll be using ink, markers or paint rather than crayons or colored pencils. Consider printing on card stock rather than plain paper to prevent your pigments warping or bleeding through your page. Please do not sell the PDF files and do not sell printed copies, or use the image for any commercial use. You are welcome to give printed copies of this image unaltered as gifts, but the artist requests that you please do not give away copies of the file itself.